The 24.51 metre sailing yacht Ruling Angel has been sold with Steve Deane at Luke Brown Yachts acting for the buyer and seller. 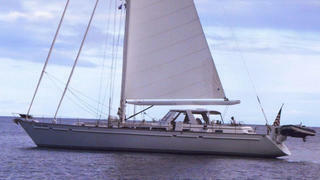 Built in GRP by US yard Gulfstar, she was delivered in 1986 with a massive refit in 2005. Under the guidance of the composite engineers at High Modulus in Auckland, New Zealand, she received a major hull, deck, bulkhead, and chainplate reinforcement refit to create an unusually strong and capable offshore fast cruiser. This major refit, which cost in excess of $750,000, allowed the previous owners to complete a 65,000+ mile world cruise in safety, comfort and speed. A teak interior has accommodation for six guests in three cabins consisting of a master suite, a double and a twin, all with entertainment centres and en suite shower facilities. The main saloon is more akin to one found on a motor yacht, with a U-shaped settee to port around a large table plus a bench settee to starboard, two armchairs and coffee tables. Also to starboard is a bar with two stools and an entertainment centre including a Sharp flat screen television set. Forward, the galley has a dinette for relaxed dining. Notably dry at all times within the enclosable cockpit, handling under sail is made a pleasure with hydraulic winches and hydraulic roller furling sails. Under power, a turbo charged 325hp Caterpillar diesel engine gives her a range of 1,800 nautical miles at 9 knots. Lying in Fort Lauderdale, Florida, Ruling Angel was asking $529,000.